Born in Tokyo, Japan, Tamami is a Middle Eastern dancer, instructor, and choreographer, now based in La Jolla, California, USA. Her love of the arts and music began in childhood, was nurtured at Tokyo's Gakushuin University, where she studied psychology, and has deepened through travel, study, or residence in Vietnam, the United States, Europe, and Egypt. Tamami's passion for Middle Eastern dance began under the instruction of Somayya, a founder of Japan's Studio 1002 and a protégé of Karima in Japan, who taught Somayya the Egyptian style of dance, and of Sema Yildiz in Turkey, who taught her the Turkish and Roma styles. Beginning with Somayya, Tamami has learned Egyptian-style Middle Eastern dance (including forkloric dance) from the world's top Egyptian dancers in Egypt, Japan, the United States, Canada, and Germany. Tamami has been expanding her performance and teaching experience globally and locally, sometimes blending some different dance forms in her performance. Tamami has been a troupe member of Sands of Arabia, led by Lucia of San Diego, and also has been an instructor of Studio 1002 in Japan. 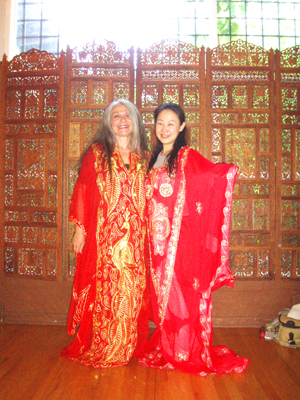 Tamami's journey to discover the beautiful secrets of Middle Eastern dance continues to deepen. She now enjoys performing internationally and teaching with her broader knowledge. Outside of the dance world, Tamami received a master of science in Mind-Body Medicine, and continues her research towards her PhD degree. Her research website is Mindbodygrace.org. ©Tamami Shirai All Rights Reserved.